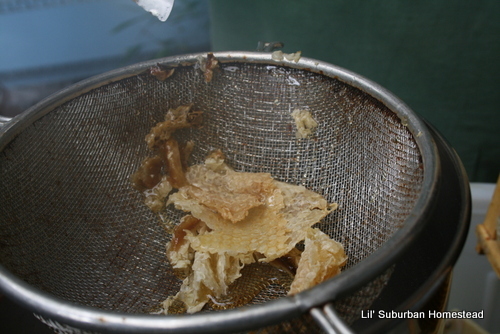 So we have waited..days…..weeks…months…waited for the first glimpse of the golden elixir we call honey and finally the day came where we could at least harvest a wee bit of honey because one of our hives became “honey bound” a term beekeepers use when you need to create more space for the queen to lay eggs. So because we use store bought foundation we had to proceed with this process very carefully. 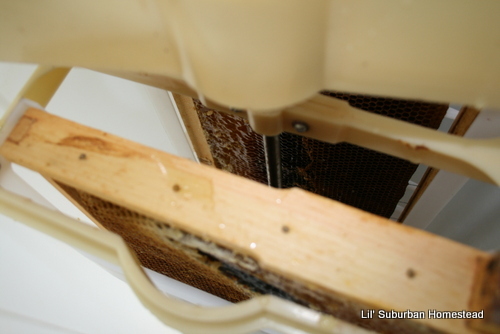 A good friend of ours loaned us his honey extractor even though he needed it the very next day so timing is everything we had to hurry to get what we could get the frames back in the hive and return the Honey Extractor not only that but we did it all in the greenhouse with a heater on so it was a “Hot, Sticky, Messy” event but the thrill of seeing the beautiful golden honey did not discourage me. There is no feeling on this earth like raising your own bees for honey. 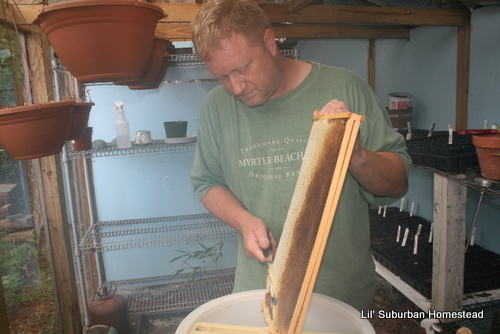 Chickens are fun to raise and I love it but my husband has had to really get to know his bees and since they are unpredictable I really think there is an art to raising bees. The bee keeper has to have an intuition, a 6th sense I guess to be able to predict their next move and also has to pay extreme attention to detail to watch for swarm cells, and queen cells too. 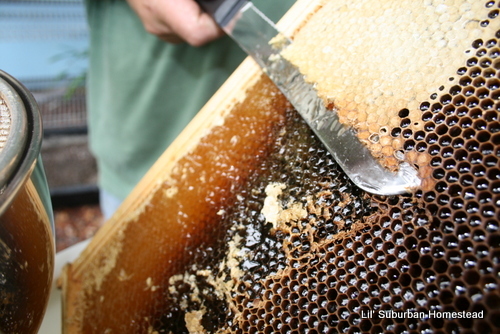 Thanks for coming by to see our first Honey Harvest Pictures! By the way I consider honey to be the ideal sweetener used in moderation. 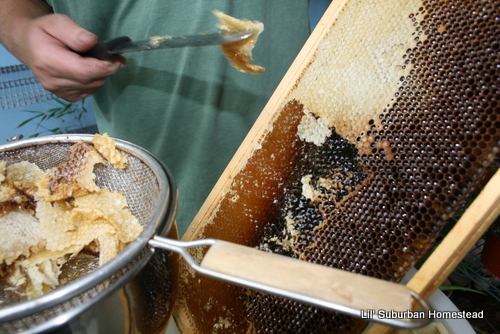 When it is raw and unfiltered it is loaded with lots of pollen and enzymes that are so good for you. Since I switched to eating local honey from local bee keepers two years ago prior to raising our own I no longer have seasonal allergies anymore when the pollen hits locally it does not bother me at all. Thanks for the invitation Shanna! My husband is really the brave one! I take the pictures mostly and help with the harvesting……however I am suiting up soon. How exciting, that looks like a wonderful first harvest to me. Enjoy it! Thanks Carol! We are so excited! 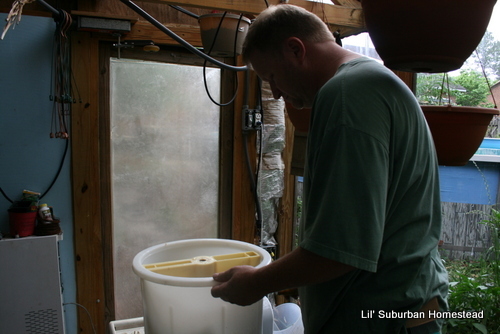 I think it’s fantastic that you have invested the time and energy to raise bees for honey. From my perspective it looks like you got a pretty good haul this time too. Matt I was actually surprised we got that many pints from only 2 frames that were not even all capped. Thanks for stopping in. This is a cause for Celebration. WooWoo. I commend you both on your success that comes from hard work and skill. Thanks so much Lois! We were so excited because we had been waiting and waiting but the gals take their time! So glad you hopped over here! Congrats! Beautiful! Not much better than honey straight from your own hives. Having kept bees many years ago I know it does indeed take a lot of work and “intuition” to be successful, not to mention lack of fear of the bees and a calm nature when working with them! 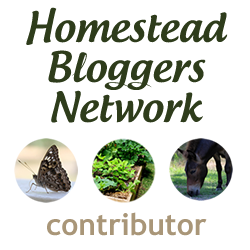 Maggie you just described my husband although with them being on our homestead I am more and more comfortable and no longer have the fear that I once did. Thanks so much for visiting and for the encouraging comments. Congratulations on your harvest. By the way, your garden is beautiful…such a nice job. Thanks Karen for the compliments! We are so excited about the little bit of honey we got too! Way to go. Hope the queen sorts herself out. Thanks Katherine! Yes we do too! Oh wow–lucky you guys! What fun it must be to raise your own bees, and so satusfying too. Congrats! Kristi I knew what you meant and it is so gratifying and satisfying! Thanks for your comment! That’s so great! Your own too (with bee help). You can be really proud of that. Thanks Kathy! We are very proud those bees are amazing! Wow, that’s quite a bit of honey. It looks so yummy. Congrats. Also your garden is wonderful! Thanks so much Lisa! We really are pleased with the amount of honey we got out of only 2 frames that really weren’t even completely ready! Thanks for stopping by! Looks like a great honey harvest. Thanks so much Donna! It is delicious! How gratifying! This is something I aspire to do someday, bees and chickens. Enjoying learning from your experience! 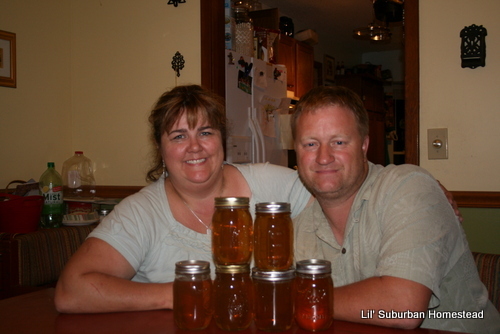 Pingback: Honey 2012 « Living the Good Life in Gaston County!